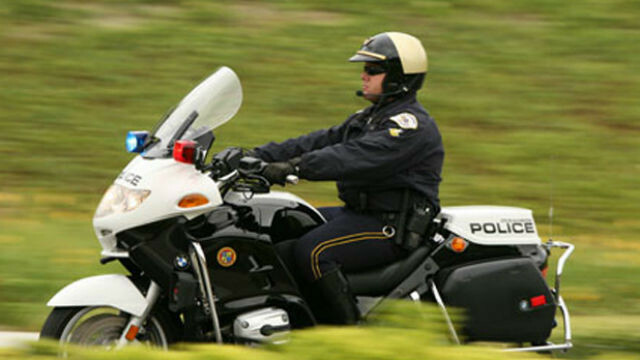 An Oceanside Police officer on a motorcycle. Courtesy Oceanside Police. A speeding motorcyclist suspected of driving drunk failed to make a curve in Oceanside Saturday morning in a collision that seriously injured him and a passenger, police said. Oceanside Police officers responded to North Pacific Street near Breakwater Way at 1:45 a.m., where a 46-year-old man and his passenger, a 39-year-old woman, were found lying near the wreckage, according to Sgt. Richard Schickel. The two were riding northbound on a 2003 Harley-Davidson when it hit a curb, ejecting them both. They sustained serious injuries and were taken by ambulance to a hospital trauma center, Schickel said. The Oceanside Police Department‘s Major Accident Investigation Team was conducting the investigation. Anyone with information regarding this crash was asked to call accident investigator Gabriel Cobian at (760) 435-4989.